Preheat oven to 350 degrees. Coat a 12-cup Bundt pan with cooking spray with flour. In an electric mixer or in a large bowl using a hand mixer, add all the cake ingredients except the eggs and egg whites. Mix until blended. Add all the eggs and mix until blended. Turn the mixer to high and beat for about a minute or 2 until smooth. Pour the cake batter into the coated Bundt pan. Spread evenly. Bake for 55-6o minutes, until a toothpick inserted comes out clean. Remove cake from oven and cool for 10 minutes. Carefully loosen all the sides and center of cake and turn the cake over onto a plate. To make the glaze: In a small bowl, add the powdered sugar, lemon and lime juice and corn syrup, if desired. Mix until very smooth. The glaze should be thick. Divide the glaze into three small dishes. Leave the glaze in one of the dishes white. Add 1 drop of yellow food coloring to one of the dishes and mix well. Add 1 drop of green food coloring to the other dish and mix well. Drizzle the white glaze all around the top of the cooled cake. Nest, drizzle the yellow glaze over the top of the cake. Finally, drizzle the green glaze over the top of the cake. We’ve got a terrific way to celebrate Spring. Bake a fabulous 7-up cake. This nostalgic cake has been popular since the 1950’s. It’s a true Southern treat and a soul food favorite. 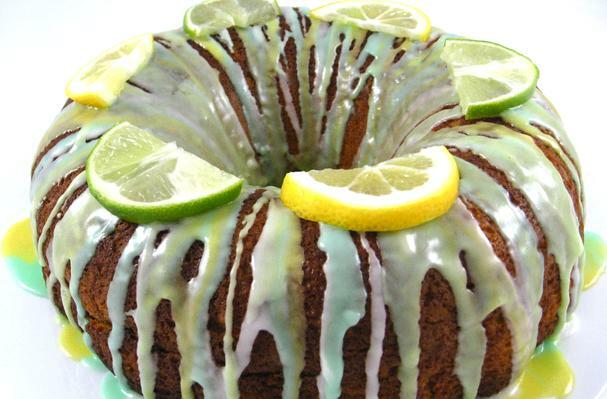 It’s so moist with just enough lemon-lime flavor without being overpowering. Adding soda to a cake instead of water creates a light and airy consistency. We’re starting with a mix and making ours skinny by using diet 7-up, a small amount of canola oil and applesauce for the fat and using both eggs and whites. Take a trip down memory lane with this fantastic cake. What a delicious way to welcome the new Spring season.